Seiko’s SKX007 is a classic in the dive watch genre. It takes the lead from the original Rolex Submariner, but gives us a far more affordable option. But Seiko did not stop there. They also made the SKX009 Pepsi, and now they have a few other variants worth checking out. One if the SKX173, which is similar to the SKX007, perhaps too similar. But there are a few key differences. The SKX007 is the original, whereas the SKX173 is for the US market only. Just like with the SKX009 and SKX175 Pepsi bezels, only this time there are also some design difference between the watches. These two watches differ most in the details on the dial. Both SKX007 and SKC173 have a black dial and bezel with white markings that are lumed with Seiko’s always bright lume. But, the hour markers are clearly very different. The SKX007 has the classic SKX look with the round hour markers, and the oblong marks at 6 and 9 o’clock, and the triangle at 12. It gives the watch a softer, less refined look in my opinion. The SKX173 on the other hand has far more defined, hard edged rectangles, that clearly display the lume. And the 12 o’clock marker is thin, long and divided, making it easier to read. The main hands, hour and minute, are the same shape on both watches, but the lume is more prominent on the SKX173. However, it’s on the second hand that you will see the biggest difference. The SKX007 has the standard SKX second hand, which is a long thin hand with a black base end and a lumed circle on the back. The SKX173 design has flipped this on its head – the second hand is all metal up to the tip, but just back from the tip is the lumed circle. This makes for far easier and more accurate time reading in the dark. The last thing to note is the writing on the dial. It’s a small difference, but an important one for imported watches. The SKX173 is for the US market only so must show its country of origin. That is why you can read the words “Malaysia” next to the 6 o’clock marker. The other writing “7S26” represents the automatic movement, and the rest, specific markings used by Seiko, usually for the dial version. 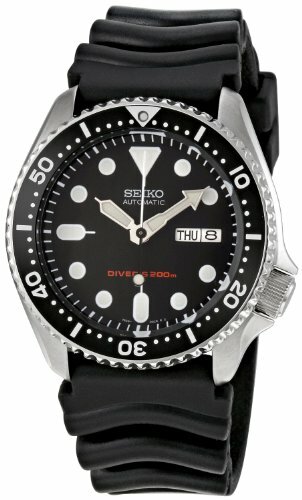 According to a number of posts on watch forums, Seiko is no longer producing the SKX173. So, moving forward, they are going to be a lot harder to get and possibly worth a lot more money. That also explains why I have not been able to find them on many watch shops and they only appear more easily found on Ebay. The SKX007 and 173 are both 42mm cases with brushed steel. The crown is at the typical Seiko dive watch 4 o’clock position. Which is great for “not getting in the way” while diving. It also has a handy crown-guard. The bezel is uni-directional and clearly marked to the minute for easy reading while diving. And the main zero marker is also a lumed triangle, which helps even more. There are two main strap options for the SKXs. You can get it in the rubber dive strap option, which is far more practical for diving or use in water. Or, you can take the more upmarket jubilee steel bracelet, if you plan on wearing it more around town. The SKX watches are rated to 200m, which means they are dive ready. Of course, you can’t take them down to 200m, not that you would. But it is designed to be dived with. Which is an important distinction from many watches. The 7s26 is Seiko’s workhorse automatic movement. It does not come with any frills like hacking or winding, but it is still a killer movement that will run for years. It comes with 40 hours power reserve, when fully charged. So, you may not need to buy a winder, unless you put it away quite often. It all comes down to which dial you prefer. The SKX173 is more striking and modern if you ask me. But in the end it is not my watch.The SKX173 is not always the easiest to come by, and you might have to pop over to some sellers on Ebay (Amazon does not seem to stock it).